Black salt is a volcanic unrefined salt. This kind of salt produced in fields where salts are substances containing hydrogen sulfide or similar substances. The advantage is that they increase peristalsis of the intestine, act as a mild laxative and stimulant to the intestine. Also, thanks to bogatomu natural ingredients, black salt tastes less salty and more useful. On properties it is similar to soy sauce - rich in substances that act in the body like enzymes, improve digestion. Although black salt is called black, it has a reddish-brown color due to the fact that it contains some amount of minerals and iron. As white salt, it is sold extruded and ground, and store it in a cool dry place. This salt can not completely replace the sea or table salt, as it has a peculiar smell (it resembles the smell of hard-boiled egg yolk). Probably due to the presence of small amounts of hydrogen sulfide. The content of NaC (sodium chloride)l black salt is lower than in regular table salt. In this regard, the black sea salt is more safe compared with common terms deposits it in the joints. Black salt is the main ingredient in the popular Indian spice "chat masala" ( salad dressing ), which is added to fruit salads and toasted nuts. Black salt has been used successfully as a substitute for salt. Black salt is rich in iodine, potassium, sulfur, iron and other trace elements. Put in all the dishes, to put ordinary salt. The disadvantage is a slight egg taste, but combined with other spices it becomes invisible. Black salt in normal doses does not cause retention of water in the body, as do other types of salt. In India black salt is included in the "home kit". According to Ayurveda, the ancient medical science, black salt contains the elements water and fire, contributes to the normal functioning of the digestive system and clear intelligence. 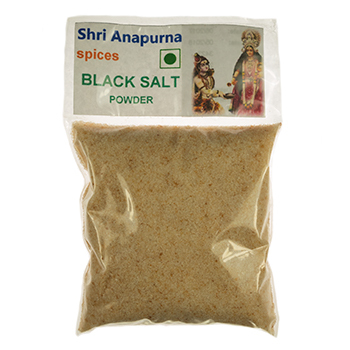 Original name: Black salt Anapurna. In our store You can buy authentic Black salt Anapurna at the best price!